It's ironic when a figure of a man known for hitting what he aims at misses the mark. Clint Barton doesn't have super powers. But what he does have is the ability to hit any target, no matter how small or distant. That's all he does, but he does it better than anyone else in the history of the world. Even without the uncanny powers of his superhuman peers, he remains one of the most dangerous men on the face of the Earth. Well, he originally did it without the uncanny powers of his superhuman peers, but the Ultimate Hawkeye comic established that he has ocular enhancements: he has many more rods and many fewer cones in his eyes, meaning he sees in high-contrast black and white, and doesn't notice most attempts to trick the eye, such as camouflage or one-way mirrors; he also has increased musculature around his eyeballs, which allows him the ability to manually change his focal length. So yeah, he's a "plain" human, in the way blueberry waffles, bacon, eggs, and fresh OJ are a "plain" breakfast. 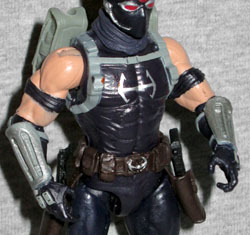 This figure doesn't depict Hawkeye in his original costume, but rather the second one, designed by Joe Madureira and first seen in Ultimates 3. Hawkeye was in a dark place at the time, so he wore a full mask (because he couldn't stand to look at himself) and had a target right in the center of his forehead. Well, sometimes a target; sometimes just a big dot. The forehead dot is a raised element of the sculpt, as is the thin microphone on the right side of his face, and the goggles in his mask (which, until the retcon about his special eyes, were actually corrective lenses). He's wearing a harness around his shoulders, a utility belt, pads on his elbows and knees, and armored places on the backs of his hands and forearms. There's a separate scarf dealie around his neck. The costume appears a bit more "spandexy" than the comics' armored look, with small wrinkles stretching over his muscles. The stylized H on his chest is just painted, but the one on his belt is molded on. As with most of the Avengers toys, the articulation isn't quite as good as it should be. He moves the same way as Ultimate Thor: no wrists, no ankles, no waist, but a balljointed head, swivel/hinge shoulders, elbows, hips and knees, and swivel thighs. The crazy thingis, if you look closely at the ankles, you can make out where the joints were intended to go: there are lines that clearly would have been the swivel, and bumps where the pin for the joint would have stuck through. Normally we'd point out how stupid it is that he can't get into a real archery pose, but at this point he was more about the guns than the bow and arrow, so it's fine. And sure enough, his accessories include guns. There's one normal pictol and one scaled-down copy of Fantomex's gun. He also gets a small handheld crossbow, like Huntress would use. The pistol has its own slot in the tray, but the Fantomex gun and the crowssbow are rubberbanded into his hands, and so they get warped all to hell before you open the package. The two guns fit in the holsters on his belt. 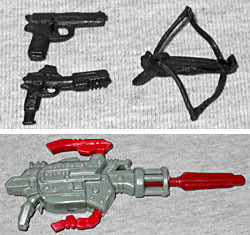 He's also got a big missile-launching accessory that even the Rise of Cobra toys would find excessive, and three differently colored projectiles to fire from it: one blue, one green, one red, all with unique sculpts. Two of them can store in the packs on his back. Ultimate Hawkeye isn't a particularly great action figure, but he's good enough - a few missing joints aren't enough to keep him down.